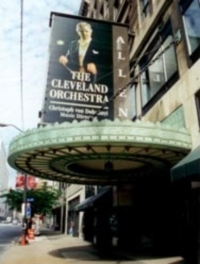 The 1921 historic Allen Theatre is the largest of 4 theaters of Cleveland's Playhouse Square Center – the second largest theater complex in the United States. Turner Construction was chosen to lead the construction of the historic preservation project. To begin the project, Turner chose Precision Environmental to perform the asbestos abatement and selective demolition required prior to new construction. To expedite the scheduled project duration, Precision was able to perform asbestos and demolition tasks simultaneously providing the project increased efficiency and flexibility. 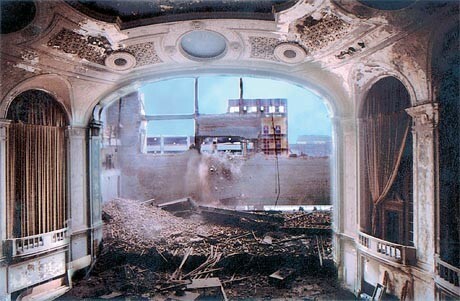 The main component of the demolition included complete removal of the entire stagehouse building. This demolition included everything behind the stage curtain wall and foundations. With historic preservation as a key to the project, careful and precise demolition techniques were used to protect the original ornate plaster ceiling and crown-molding. Separation between the stage house and seating area was performed by hand using diamondblade chainsaws and pneumatic hammers. Prop rigging and structural steel supports were hand torch cut and removed as well. Precision executed this portion of the work flawlessly and left the plaster intact as planned. Once this separation was safely prepared, normal equipment demolition could proceed. Precision's highly skilled crane operating engineer systematically removed the roof and walls away from the theater. A most especially difficult task was the removal of a three-course thick brick wall which was constructed directly up against a neighboring building. Originally thought to be required to perform by hand, Precision's talented crane operator successfully peeled away this wall without damaging the adjacent building. This meticulous operation saved not only the adjoining structure, but valuable time and labor. The entire project required much collaboration and communication between the owner and all parties of the construction team. Understanding of the importance of the historical preservation of the theatre was always made paramount for each member of the crew. Precision is extremely proud to have been associated with such a monumental and historic project such as the Allen Theatre. Selective demolition and asbestos abatement during renovation of historic stagehouse in downtown Cleveland, Ohio.